What to do in Vicenza? Book your activities with vivovenetia! You have decided to holiday in the Veneto part of Italy! Great choice! Venice will surely be your first choice, Padua and Verona are also worth visiting but there is another city that you absolutely must not miss: Vicenza. Open your eyes to what to do in Vicenza and the surrounding area. 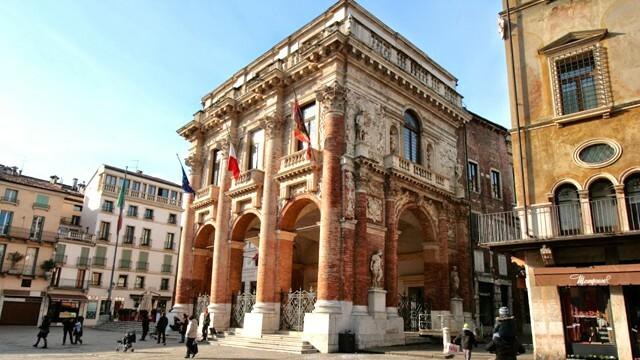 Vicenza has a great deal to offer in terms of architecture and art and was made a UNESCO World Heritage site in 1994. Thanks to the enormous contribution of the architect Andrea Palladio, Vicenza is considered an open-air architectural museum. Palladio has left his unmistakable signature upon much of the city. Designed by Palladio are jewels like the Palladian Basilica, Palazzo Chiericati and the splendid Olympic Theater. Get your camera ready and let's go! One of the most evocative places in Vicenza is certainly Piazza dei Signori, overlooked by the famous Basilica Palladiana, the work of one of the greatest architects of all time.It is a splendid building with two floors of arches in white marble. There is also the Bissara clock tower, restored in 2002. The clock strikes normal hours and half hours but the bells also ring the ninth hour with a particular melody composed by Maestro Valtinoni which can be heard for seven minutes before noon and seven minutes before six o’clock in the afternoon (originally instead of 18:00 it rang at 24) No less interesting is the Palazzo del Capitano which stands out as a grand structure with brick columns. The Republic of Venice has left its mark here too. The two columns at the bottom of the square have a familiar appearance. The winged lion, the symbol of the Serenissima and erected as a sign of submission by the Vicentines, and the other, Christ the Redeemer to protect the citizens of Vicenza. Take time to walk and explore the city to the fullest. Pass through Corso Andrea Palladio with its shops and restaurants under the galleries and arcades. This great street will lead you to Piazza Matteotti where the grand edifice of the Chiericati Palace stands, another Renaissance building of Palladio it is also home to the museo civico that houses collections of paintings from the 16th century, prints, coins and statues. The Santa Corona complex of the Dominican friars order, is one of the most interesting churches to see in Vicenza. The construction of this gothic church dates back to the Middle Ages (1261) and it was actually the seat of the court of the Holy Inquisition. The capital of Vicenza is surrounded by greenery and if you want to also enjoy a splendid view, take a walk to the Basilica of Monte Berico which is actually on a lake above the city. 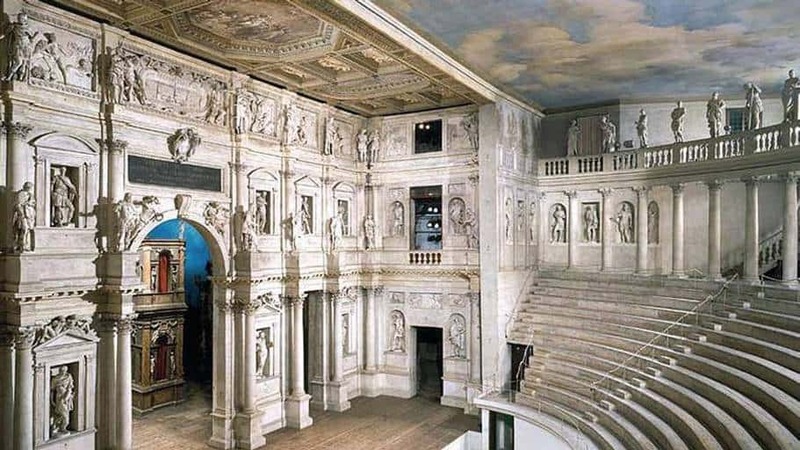 One of the most amazing sites of Vicenza is the Olympic Theater (teatro olimpico) also designed by the industrious Palladio! Despite being built in 1585 it is inspired by Greek and Romans amphitheatres and is the oldest covered theater in the world. It is on the UNESCO World Heritage list. As many as 95 statues of gods will look down at you while you watch a show here. It really is worth a visit! Vicenza is a small and precious gem in the Veneto region. The whole area is in fact dotted with Palladian villas. The beautiful Villa Godi or Villa la Rotonda, designed as a temple-villa, or Villa Valmarana ai Nani, south of Vicenza, named after the numerous sculptures of dwarfs all in a row to protect the unhappy daughter of the owner of the villa,who was herself a dwarf. 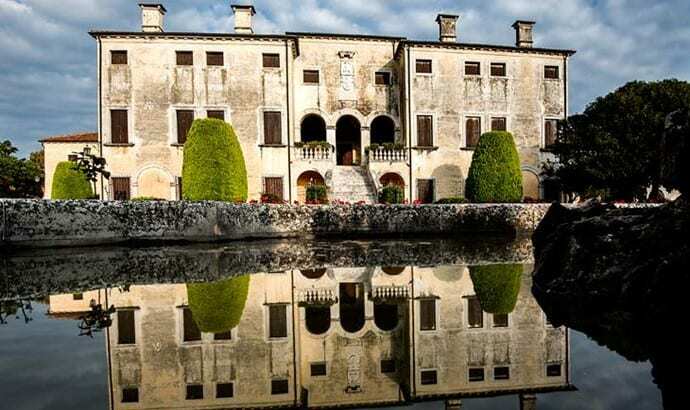 There are other ways to explore this beautiful part of the Veneto. You can rent a bike in Bassano and explore one of many routes. Discover small hidden medieval villages or explore Monte Grappa, if you like mountain biking!. 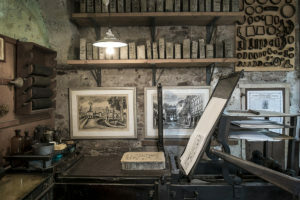 In the historic center of Vicenza you can have a go at creating your own lithography at a typical artistic printing house. 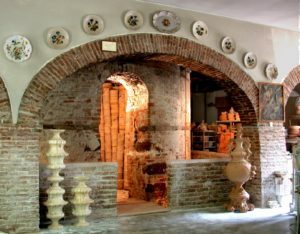 A few km away, on the right bank of the Brenta River, you can also visit the famous ancient factory of artistic ceramics. 1, Descend into the depths of the mountain! The Buso della Rana, a stone's throw from Vicenza, is the largest cave network in the Veneto region. It has only one entrance and a maze of tunnels that extend for 27 kilometers. Be careful not to get lost! Escape from the crowd and take a walk in the mountains, along the paths of the Alta Val Leogra, up up to the top of the mountain, perhaps on a moonlit night. 3.The wine and grappa tour! Vicenza and its hills are full of vineyards. 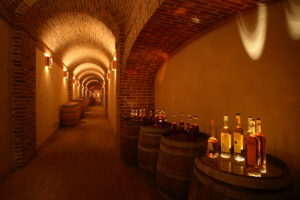 Why not try a wine tasting visit, or sample some grappa at the famous Poli distillery. 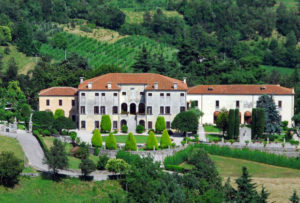 Or visit the Villa Angarano, also designed by Palladio and sample fine wines and local produce, in a beautiful setting ! 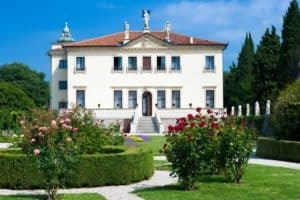 Nestled at the foot of the Asiago Plateau, Villa Godi Malinverni with its frescoed salons, opens the doors to its house and garden for a tour dedicated to history, art and beauty! Get involved and immerse yourself in the crafts of the Vicenza artisan workshops. 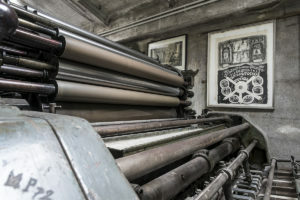 Vicenza is a city of art and craftsmanship and you can learn their ancient techniques, from printing workshops for children to lithography and art print workshops for the whole family. These are not the usual museums! Miniature train museum, in Schio, lots of fun for everyone! Ecomuseum of straw in Marostica, with an unusual collection of objects in natural fibers. The area of ​​the Berici Hills is a place of extraordinary natural beauty. There is a focus on artisan and food and wine here that means that there is a calendar of festivals and fairs throughout the year particularly during the summer. 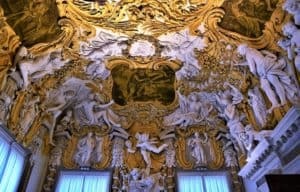 The Antonibon ceramics factory began its production at the end of the 1600s, and today its fine porcelain creations are appreciated by kings, queens and ambassadors and are exhibited in museums. 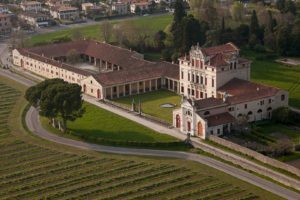 The province of Vicenza is committed to restoring the natural environment of the Bosco di Dueville, one of the most charming wetlands of the Veneto region. Here runs the splendid Bacchiglione river. 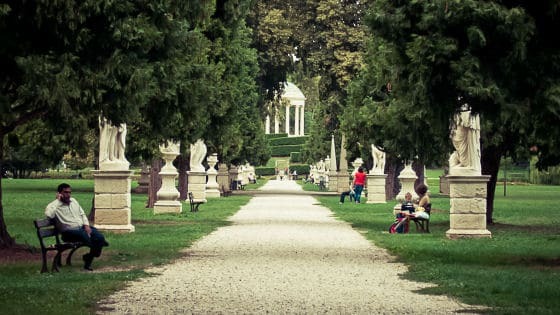 In Vicenza, right in the historic center, you will find a spectacular park.Parco Querini is a vast green space where you can admire the architectural beauties of the city of Palladio while enjoying meadows, lakes, canals, hills, temples and sculptures.